My Bargain Basket: Target: Possibly FREE Faux Suede Ottoman (Clearance Item)! Target: Possibly FREE Faux Suede Ottoman (Clearance Item)! Clearance prices and products do vary from store to store. You may not be able to find this clearance deal below at Target, but it never hurts to keep your eyes peeled… especially when you may be able to snag something for FREE! 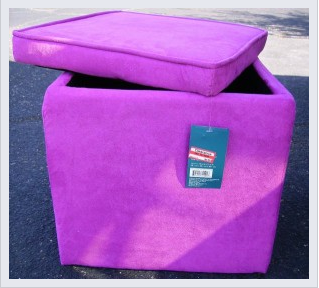 The Purple faux suede ottoman (pictured above) has been spotted on clearance at Target for just $4.98! What a great price, right?! Well, it gets even better because you can use the $5/1 Ottoman coupon from here (click on the “Home” category on the left hand side) to possible score a FREE Ottoman! Yes, completely FREE!